Looking out to sea from Widemouth Bay near Bude, towards Crackington Haven and Tintagel beyond on a particularly rough day. 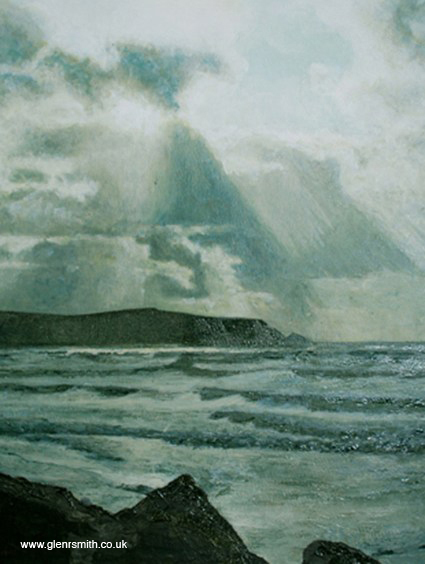 After The Storm is painted with acrylics on watercolour paper,using a monochromatic underpainting technique as a base, then adding colours with a transparent glaze, giving an almost duotone appearance. This piece measures approx 6″x12″ and is for sale. Please contact me for details. While on a short break in Kent during the summer holidays, I headed for the coast anticipating a sunset developing. 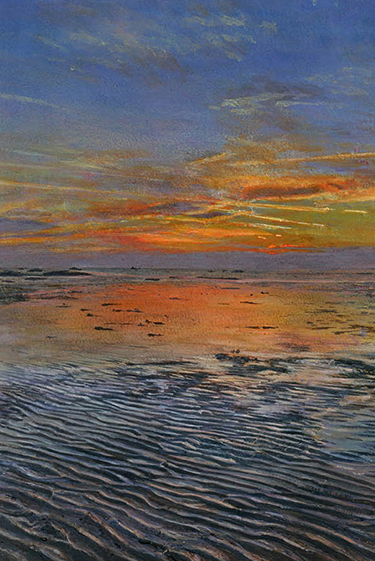 I parked the car near Reculver, walked down the slope to the beach, onto the wave sculpted sand, then stood and admired in this amazing sunset with its incredible reflected colours. 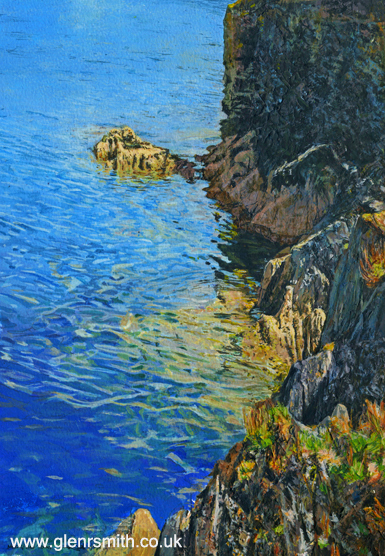 My study of the rocks and water within Mevagissey harbour, focusing on the transparency and movement of the sea. 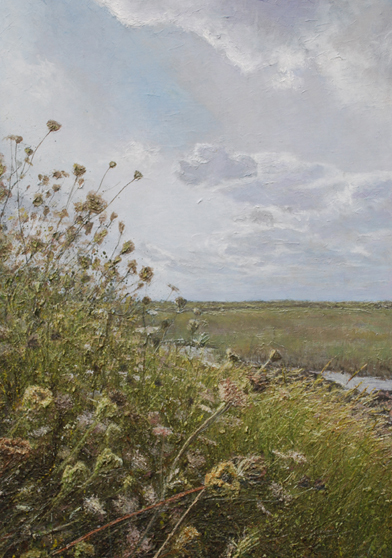 Now complete, this my painting of Oare Marshes, a nature reserve north of Faversham in Kent. 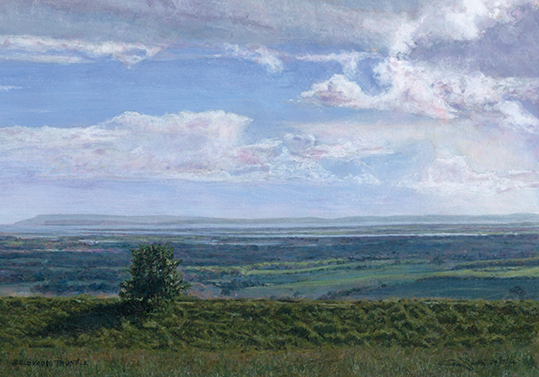 A commissioned painting in acrylics depicting the view from The Trundle, a hilltop adjacent to Goodwood racecourse. This scene, looking west towards Chichester Harbour, Hayling Island and Bembridge, Isle of Wight in the far distance. One of my first paintings dating back to 1989. This scene brings back many happy memories for me of summer holidays spent surfing on the North Devon coast with my friends. One particular day there mustn’t have been much of a swell, so we ventured into Barnstaple – the nearest reasonable sized town close to our surfing beaches of Woolacombe, Croyde, and Saunton Sands. 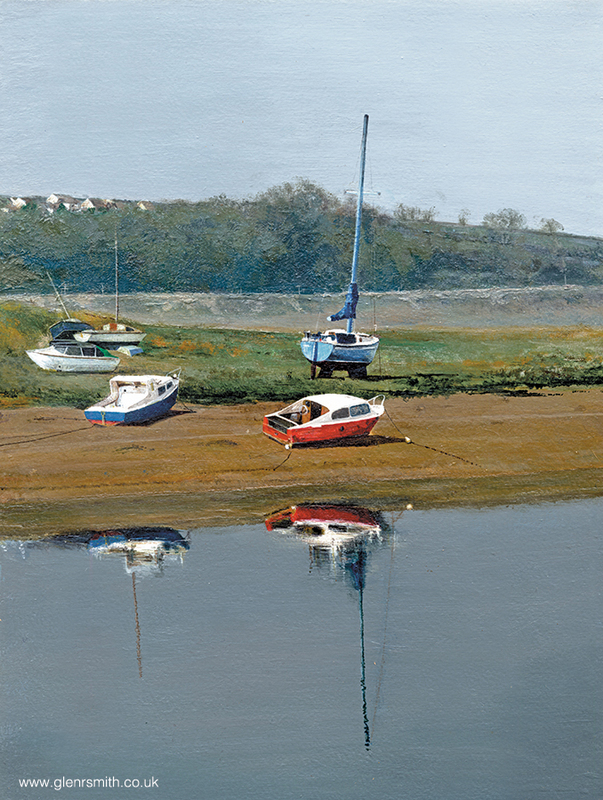 I recall a cloudless morning without a breath of wind and the river Taw was like a mirror with the various boats reflecting in its water. The viewpoint is from the old Barnstaple Town Station with the disused trackbed in the distance heading towards Fremington Quay. This impression returned home with me and I completed the piece in 1990. 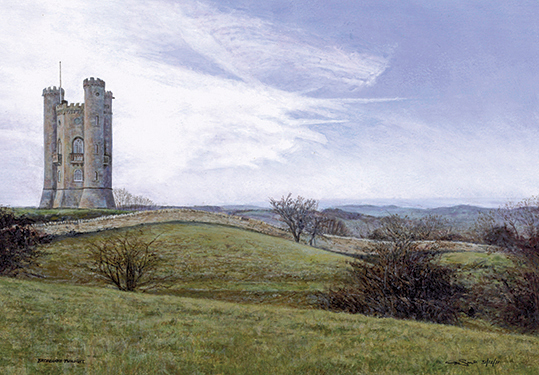 A commissioned painting of Broadway Tower of the famous Cotswolds landmark, entitled ‘Broadway Twilight’. Originally built as a folly, it served as a country retreat for artists including Arts and Crafts Movement founder William Morris. Today, the tower is a tourist attraction and the centre of a country park. Venetian Moorings is a larger painting of mine in acrylics on watercolour paper. I’ve worked on this Venice painting over a period of years – now it’s completed and available for sale. 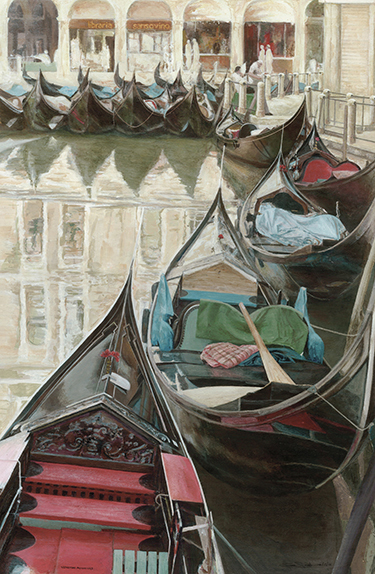 Influenced by memories of a family holiday in Italy, my aim was to capture the quiet mood of Bacino Orseolo, Venice. Moored gondolas in the late in the afternoon, leading the viewers eye towards the shops and figures in the background. Please contact me for further details, or go to my Order Prints page.